I am very pleased to be writing a letter of recommendation for TheissCare. I have plenty of reasons why I would highly recommend TheissCare to anyone. For someone like me who is 5’2″ and weighed 129 pounds it was very difficult to get in shape and lose the last 15 pounds. I had tried and tried many times using diet & exercise and different programs to lose the pounds but it was always losing at the most 5 pounds and gaining it right back. 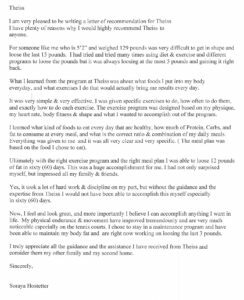 What I learned from the program at TheissCare was about what foods I put into my body everyday, and what exercises I do that would actually bring me results every day. It was very simple & very effective. I was given specific exercises to do, how often to do them, and exactly how to do each exercise. The exercise program was designed based on my physique, my heart rate, body fitness & shape and what I wanted to accomplish out of the program. I learned what kind of foods to eat every day that are healthy, how much of Protein, Carbs, and fat to consume at every meal, and what is the correct ratio & combination of my daily meals. Everything was given to me and it was all very clear and very specific. ( The meal plan was based on the food I chose to eat). 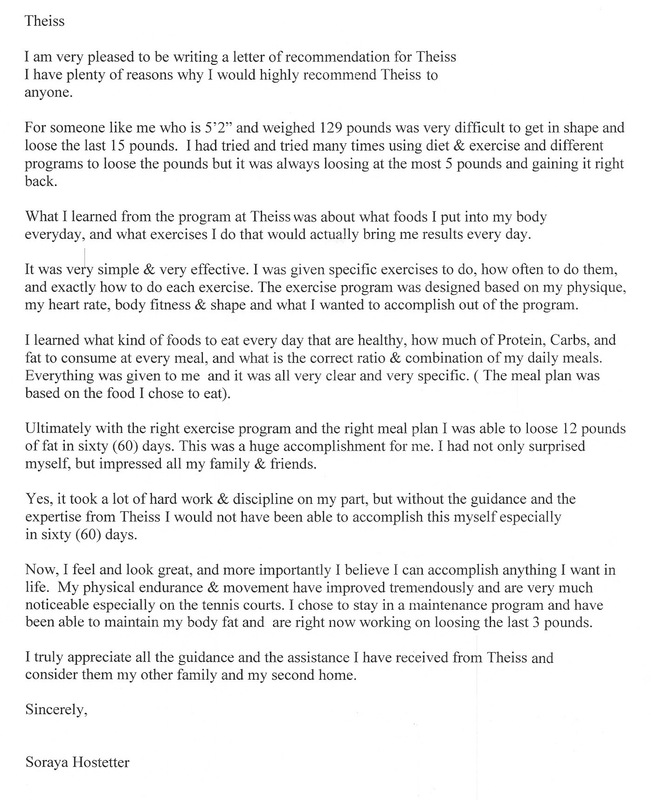 Ultimately with the right exercise program and the right meal plan I was able to lose 12 pounds of fat in sixty (60) days. This was a huge accomplishment for me. I had not only surprised myself, but impressed all my family & friends. Yes, it took a lot of hard work & discipline on my part, but without the guidance and the expertise from TheissCare I would not have been able to accomplish this myself especially in sixty (60) days. Now, I feel and look great, and more importantly I believe I can accomplish anything I want in life. My physical endurance & movement have improved tremendously and are very much noticeable especially on the tennis courts. I chose to stay in a maintenance program and have been able to maintain my body fat and are right now working on losing the last 3 pounds. I truly appreciate all the guidance and the assistance I have received from TheissCare and consider them my other family and my second home.